The Voice of ZoidBaron | A geekseye view. Or something. So this next section to my Kazakh series has taken a while to make it online. Sorry about that! After a later start than I had become accustomed to, we started our day with a short drive to Sairam, a small town on the outskirts of Shymkent. While in Sairam we took in the Sairam History Museum, to find out about this small towns influence on the history of the Silk Route, as well as a mausoleum built over the tomb of Ibrahim-Ata, the father of Khoja Ahmed Yasawi, whose place in Kazakh history you can read about in my day three blog. I am sorry to say, though, that I found the Sairam History Museum a little disappointing. There seemed to be only a few items within the museum, though everything is well-kept. As is common, there was no language other than Kazakh on any of the signs, and the museum guide only spoke in Russian, although our tour guide did translate everything for us. I would not necessarily recommend visiting. I will admit, though, that my view may be coloured somewhat because I prefer to explore museums in my own time which, due to the language barrier, was not possible. Our next stop was the Mausoleum of Ibrahim-Ata. It was the smallest of the mausoleums we had seen at this point, and after the grandeur of day three’s architecture it was a little underwhelming. Though, in reality, it isn’t really the architecture that is important, it is the meaning and significance of the mausoleum to people. 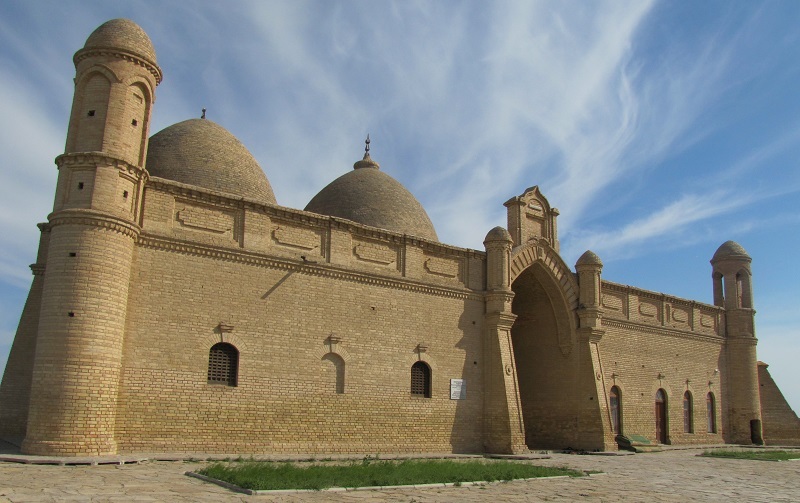 If you are interested in the history of Islam in Central Asia and Kazakhstan then it is an interesting stop as a monument to the father of Khoja Ahmed Yasawi, but otherwise it is perhaps not worth venturing to. Once we had finished in the, underwhelming, Sairam we set off for Aksu Canyon, something I was significantly more interested in, despite my fear of heights. Once we left Sairam, the day became much more interesting. 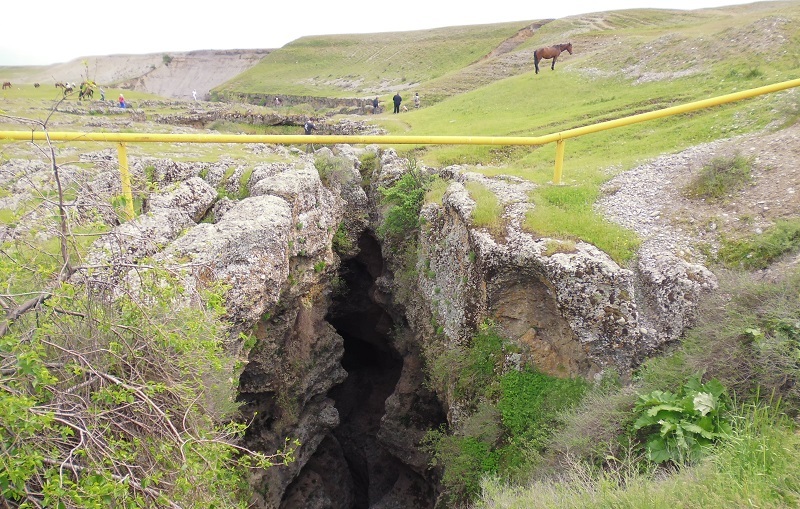 First we were to head to an area that our itinerary called ‘Devils Bridge’, though I can find no mention of this name online, before heading to see a section of the 15km long Aksu Canyon. ‘Devil’s Bridge’, complete with unfortunately placed gas pipe! We found ‘Devils Bridge’ without too many problems. It is so-called because a 30 metre drop has been carved into the land by the river below, leaving a half metre gap where it is possible to jump across. I didn’t. My fear of heights won the battle with the jumping ability of my legs, and so I took the actual bridge across the gap. The view was very nice, provided you stood with your back to the road bridge across the gap, as it had a bright yellow gas pipe running alongside it. 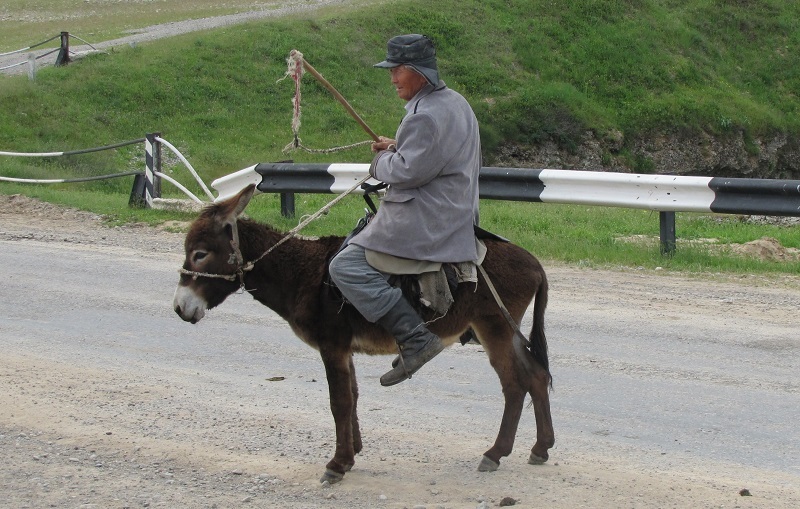 The highlight of ‘Devils Bridge’ was an elderly gentleman riding on the back of a donkey, herding goats. Not something you see every day. As we were taking in the scenery it turned out that our driver, who had driven so confidently and at breakneck speeds on day three, did not know the way to Aksu Canyon, and any local he found to ask could not help him. So when we left ‘Devils Bridge’ we started to drive around looking for it. You would think a 15km long canyon carving open the view would be quite noticeable! Over an hour later, upon learning the directions, we were finally able to make our way to the canyon. Where was it you ask? Well, the road that led to where we were planning to view the canyon was about 15 metres away from ‘Devils Bridge’, with around five minutes of driving from that point. So it took us well over an hour to travel five minutes further along the canyon it seems we were already at. Something to remember if ever you visit! Like I have mentioned before, tourism is not big yet in Kazakhstan, so there are not sign posts to every view of note! Our driver regained his confidence at this point as, with several hundred metres of clear ground to his right, he decided to drive within inches of the edge of the, at this point, 50+ metre drop into the canyon. My stomach turned cartwheels. Thankfully, we parked up a few metres after this and I was able to escape and put a few metres between myself and the edge, enabling me to fully appreciate the view. And what a marvellous view it was; from the green pastures on either side of the canyon, down through the varied, and colourful, layers of rock making up the canyon walls and to the fast-flowing, and incredibly blue, river at the bottom. While the weather didn’t live up to its end of the bargain, it at least managed to not spoil things by raining. 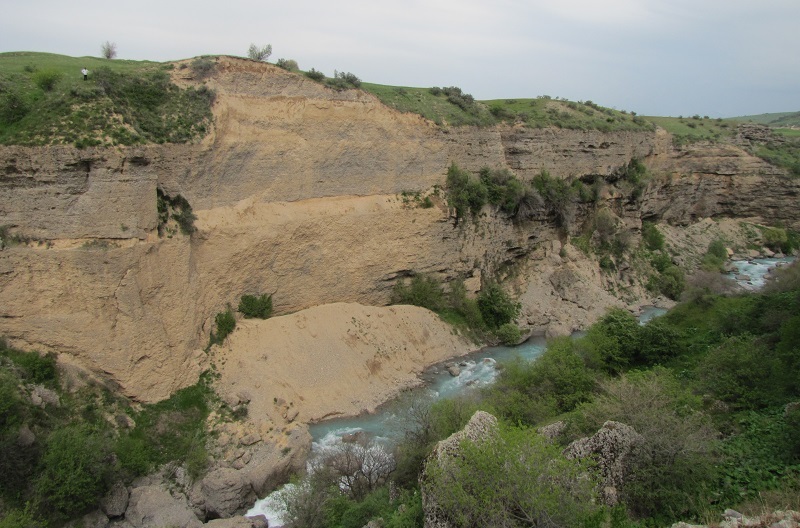 Like many of the excursions on our tour of Kazakhstan, time was not on our side, and so we only had a short time to explore this small part of the canyon. Eventually we found a well-worn path down to the river at the base of the canyon in the distance, which was quite exciting, but, by the time we had walked to it, we were called back to the minibus to move on. If I had to point out any negative to the whole trip it was the amount of time that my group and I were given in places such as this. We were given 30 minutes to an hour in areas you could easily spend whole days walking around. Because of this we only scratched the surface of what this incredible country has to offer. A good excuse if ever there was one to go back! Though it was all understandable to an extent, as our hosts where excited to show us as much as their fantastic country as possible. Our final stop for the day was to have dinner, with a difference. We had been invited to eat at the home of a local family. If you ever get the chance to try this, in any country, take it. The food tastes immeasurably better, and the experience is head and shoulders above what a restaurant can provide. I would suggest, though, going with a group smaller than the 15/16 people I was with. In such a large group the intimacy of this kind of experience is lost a little. As we arrived we were all greeted by the patriarch of the family who introduced us to his family, and extended family, including a young girl (perhaps around four or five years of age) who seemed utterly bemused/perplexed by all these foreigners invading her home. Following these introductions we were led to the dining room where we all sat cross-legged, or tried anyway, on the floor with a full spread of food laid out before us; a veritable feast. And that was before the main course of beshbarmak had even been served! The full table spread. Nom. I promised in the last part of my series to tell you about beshbarmak. 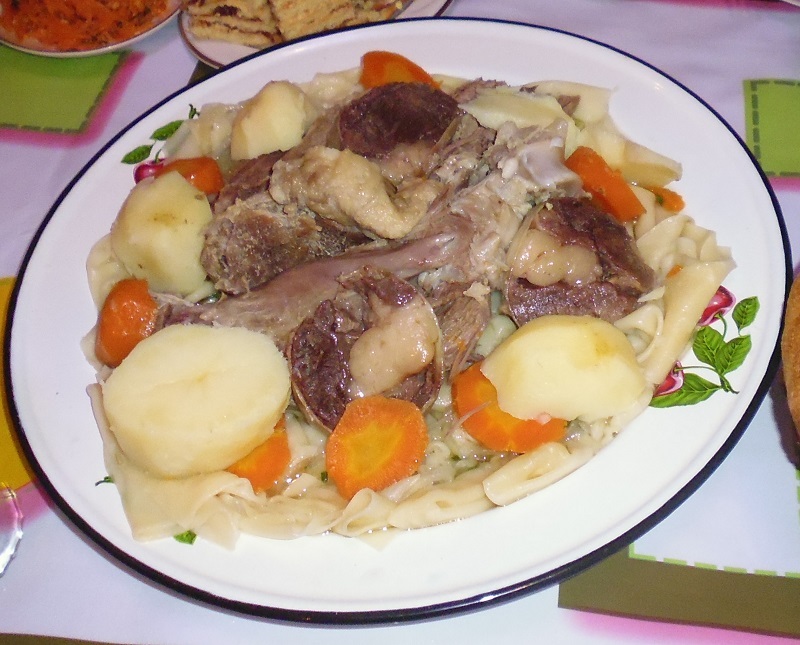 Well, it is a relatively simple dish of meat (traditionally horse), potatoes, carrots, onions and pasta-like sheets, that is meant eaten with your hands; hence the name beshbarmak, as this means ‘five fingers’. Traditionally it is served alongside a sheep’s head, which is set before the most honoured guest, from which different parts are served to the other guests, each part with a different symbolic meaning. For instance, if my notes are correct, and if I can decipher them, ears are served to children to help them listen. As is traditional, most of the meal was prepared fresh by the daughter-in-law, Kellin; this even includes things such as the butter, which was made from the milk of their neighbour’s cow. We were lucky enough to watch her make the pasta for the dish, by rolling out balls of dough until they were incredibly thin. Once we had finished eating, the father read a section of the Quran to give thanks for the meal, before we all thanked the family for their fantastic hospitality and headed back to our hotel. After a very average morning, Aksu Canyon and the family meal were something special. Two more reasons you should visit Kazakhstan. 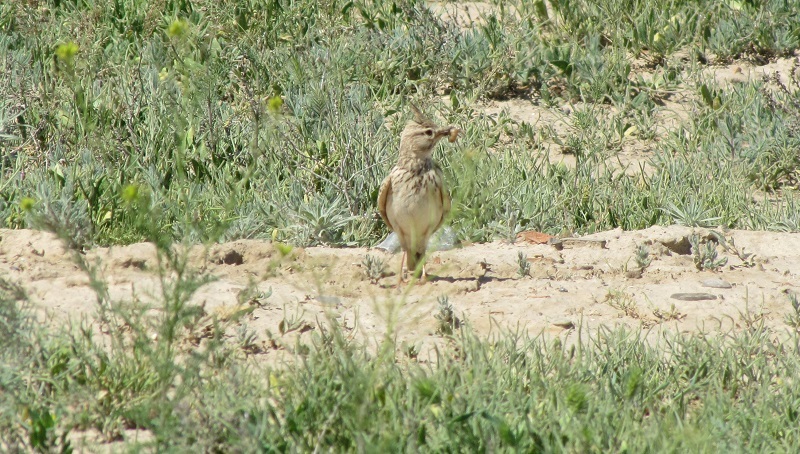 And so our time in this area of Kazakhstan was complete. In the morning we were to board a plane in Shymkent heading for Aktau on the Caspian Sea, via Almaty; but that is a story for another day. FULL DISCLOSURE: I originally posted this on www.realrussia.co.uk/blog under the title ‘The Kazakhstan Adventure, Day Four: How to Miss a 15km Long Canyon’. Words and images are all my own. I found myself writing so much for day three I felt I would split it in two to make it a little easier to read. So, presented here for you, is part one. Come back soon for part two! After finally arriving back at our hotel around 1am of day two, we were up again early to have breakfast and be on our way. The early start was certainly necessary, as we had numerous stops to make along our 500km drive to Shymkent. If I remember correctly, our ETA in Shymkent for dinner was around 8pm; I don’t believe we arrived much before 10pm, such was the amount that was squeezed into the day. 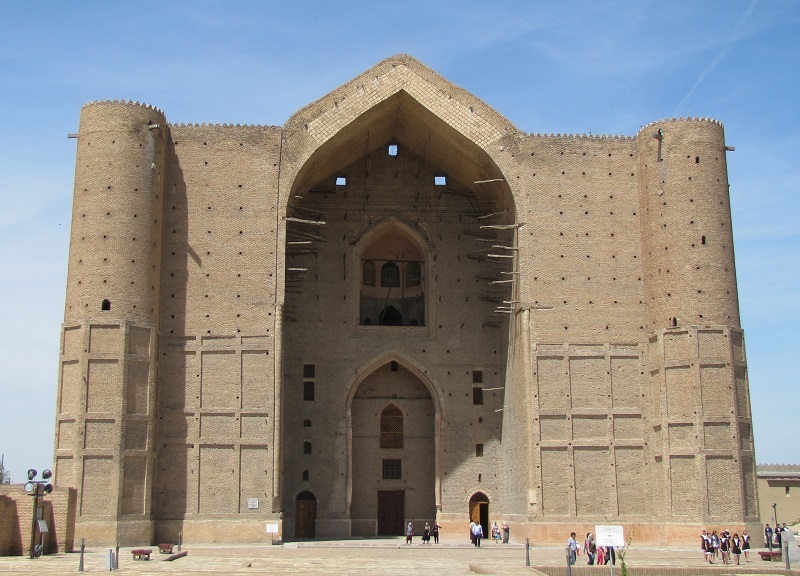 Our first stop on this epic cross-country adventure were the ruins of the ancient Silk Route fortress and city of Sauran. That is Sauran, not Sauron; there are no Hobbits here, though the incredibly well preserved fortress walls do look like they could withstand an orc attack! 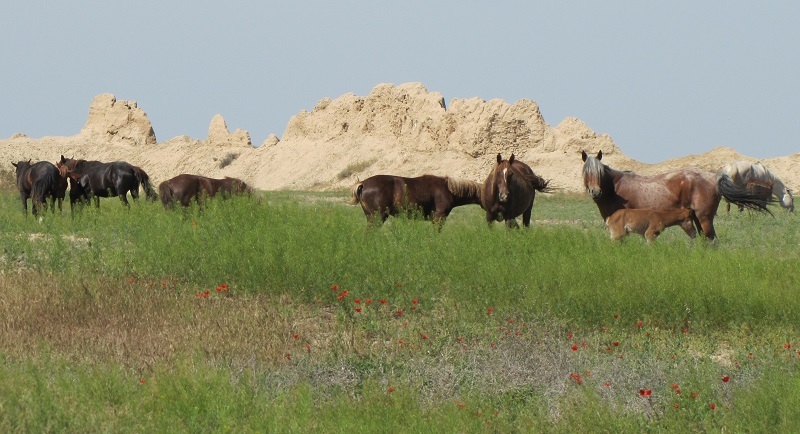 The ruins of this once great city are only partially excavated, and are a perfect illustration of where the tourist industry in Kazakhstan is at present. In many countries the excavation would be much further along, if not complete, with everything fenced off and a visitor centre built around it charging entry fees and selling tat. In Sauran, as in many of the places we visited, there is none of that. The site is completely open. There are no gates or fences, no refreshment stands or ice cream vans and no people; though there is a car park a five minute or so walk from the entrance, so it is not completely without modern convenience. This means that when you visit, it is just you, the ruins, the wildlife and the view. A wholly refreshing experience when compared to the, often, overcrowded tourist traps of Western Europe. 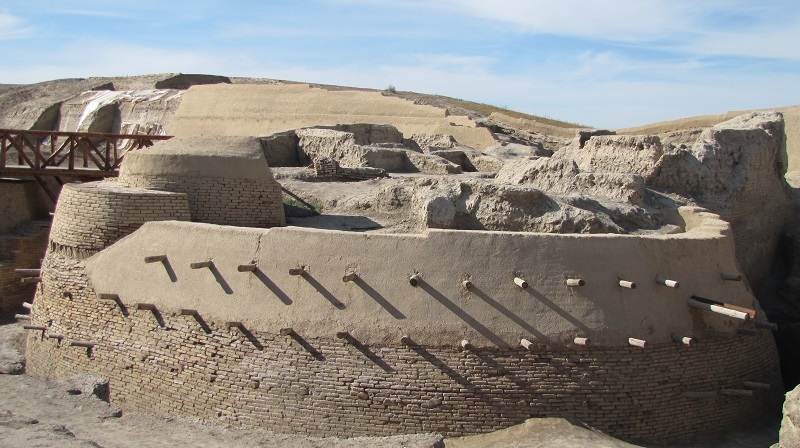 The ruins themselves are not on the original site of the city, as it often moved to stay close to the changing course of the Syr Darya, a river that originates in the Tian Shan Mountains. The town and fortress itself was thought to cover a total area of around 200 hectares, though very little of this has so far been explored and excavated. Eventually other local towns rose to prominence, and Sauran itself was abandoned, leaving the surrounding steppe to reclaim it as its own. That the fortress walls are still in as good a condition as they are in many places, so long after the city was abandoned, is a testament to how well they were built to begin with. At busy tourist locations there is often a lack of wildlife, the huge numbers of people having scared it all away. This is where Kazakhstan comes into its own. 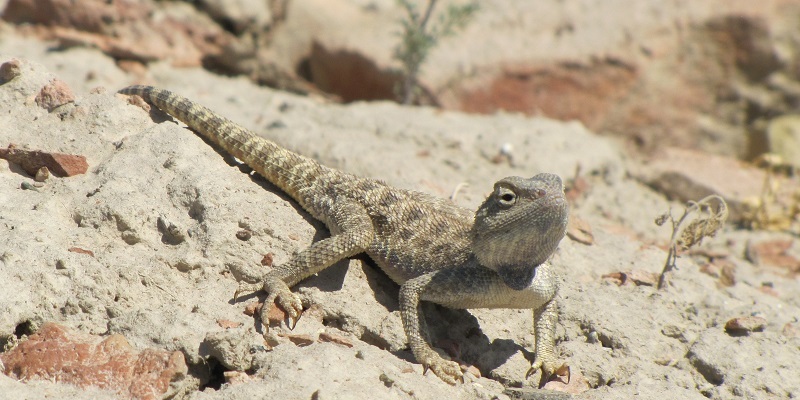 Its tourist spots are so rarely visited that the wildlife has yet to flee, meaning you can view eagles, horses, lizards, tortoises and (what Google suggests may have been) great gerbils among many other animals, birds and insects in their native habitat. While in Sauran I took a number of wildlife photos, some good, some terrible, so here are a few of my favourites. Is he sunbathing, or just snooty? 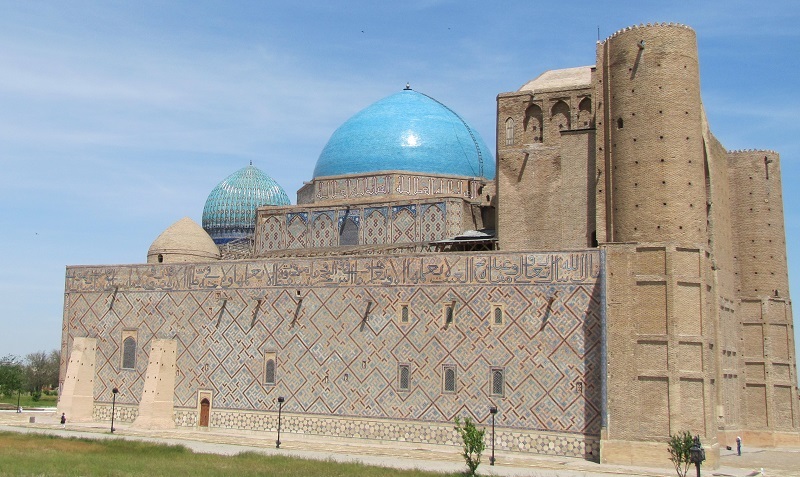 Unfortunately our time at Sauran had to end, so we moved on to Turkestan and the Mausoleum of Khoja Ahmed Yasawi. Commissioned in the late 14th century, the mausoleum remains incomplete today, though efforts are ongoing to complete, and renovate, sections of the building. 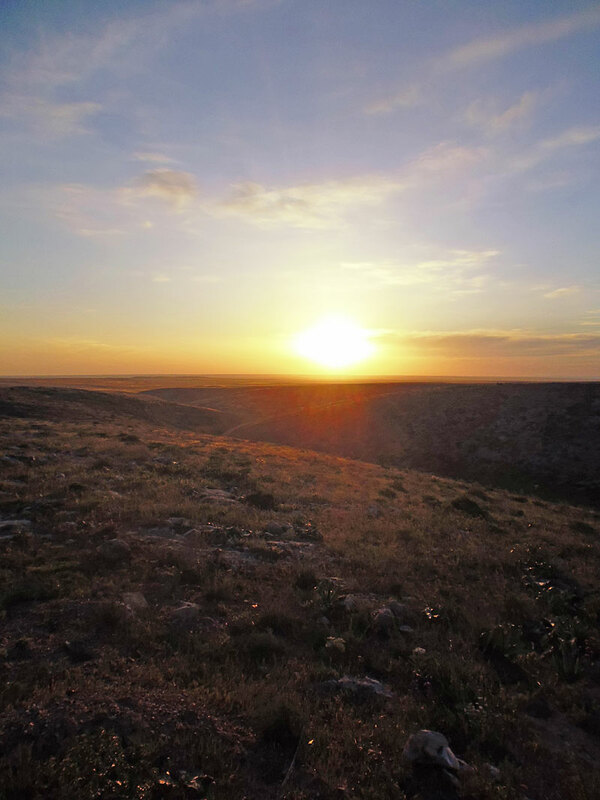 It is one of several UNESCO World Heritage Sites in Kazakhstan and it is easy to see why. The building itself is both visually impressive and imposing, standing at 42 metres, with some very intricate blue patterning around sections of the building and a huge archway leading into the central chamber. Quick side note, as part of the continuing renovation/building work they tried to match the blue of the older tiling, but were unable to. So when you walk around the sides of the building you can instantly tell which of the tiling is new, and which has been there for many years. The main archway has become an unofficial aviary, home to hundreds of birds nesting in every nook and cranny available, turning the archway into a wall of bird song and adding to the arresting nature and feel of the mausoleum. Side note number two, from the side, the mausoleum was designed to look like ‘Allah’ written in Arabic. Inside the mausoleum there are many small rooms used for a variety of purposes, such as prayer and teaching, and in the middle is an enormous cauldron, made of seven different metals and used to distribute holy water to pilgrims. 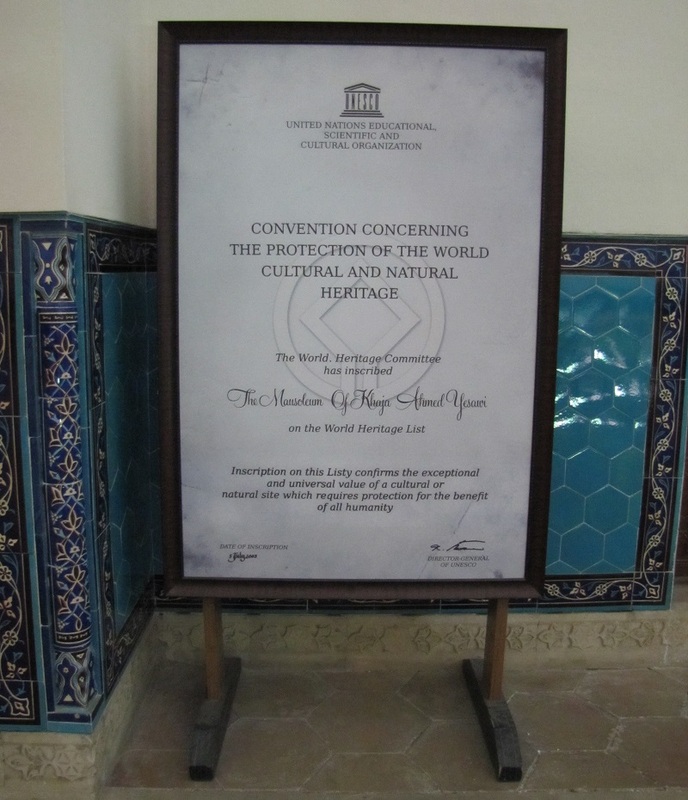 While we were not requested to remove our shoes, and we were allowed to take photographs, as this is a holy site it is best to ask permission for this first and to remember that this is not a museum, it is in active use and so respect should be shown. 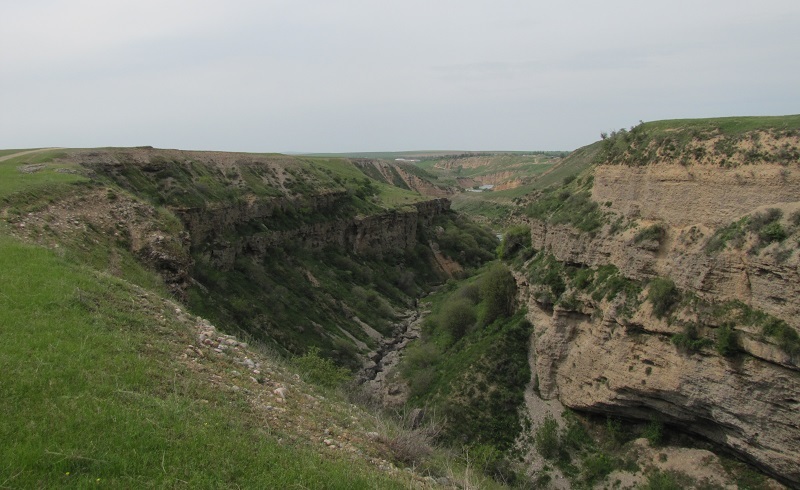 After a short walk around the grounds, visiting the excavation of several chambers 100 metres or so from the mausoleum, we headed for lunch, and then hit the road again to continue our journey towards Shymkent. Check back soon to see what other incredible experiences were left for me during the rest of day three. FULL DISCLOSURE: I originally posted this on www.realrussia.co.uk/blog under the title ‘The Kazakhstan Adventure, Day Three: On the Road to Shymkent – Part One’. Words and images are all my own. To say that my Kazakh trip did not get off to the most successful of starts quite possibly understates it a little. I was originally scheduled to arrive at Almaty airport, as per the tour itinerary, on Sunday morning. Due to a delay in my flight from Birmingham, though, it was going to be impossible to make my connection in Istanbul. To make things worse, the only flight that Turkish Airways could book me onto was a flight with British Airways scheduled to depart from Heathrow Airport a full 24 hours later, delaying my arrival in Kazakhstan until Monday morning. This alteration of my flights meant that I had to miss several brilliant excursions in, and around, Almaty. I shall not spend too long on what I missed. In fact, I shall list them, as I cannot really pass comment on what I was not actually present to experience! Panfilovtzev Park, a park dedicated to the heroes of the Great Patriotic War (World War Two). The Ascension Cathedral, also known as Zenkov Cathedral, a building that is made entirely of wood; there were no nails used in its construction, so it is pretty unique! The Kazakh Museum of Folk Musical Instruments, a museum that even offers music classes, including on the traditional Kazakh Dombyra. Almaty Central Mosque, one of the largest mosques in Kazakhstan, standing 47 metres tall with a capacity of 7000. Republic Square and Monument of Independence, dedicated to Kazakhstan’s rich history. Big Almaty Lake, a stunning lake that is 2,511m above sea level and surrounded by mountains topping 4,000m. Sunkar Falcon Farm, where guests are taught the importance of falconry in the lives of Central Asia’s nomads. With that out of the way, what I did manage to experience, once I had arrived, was two relative extremes. The morning was spent visiting the Shymbulak Ski Resort in the Tian Shan mountains, with five inches of snow on the ground, and the afternoon was spent half-way across the country, under a clear blue sky in a ‘semi-desert’ that left me wishing I was wearing shorts! But first, I shall back up a bit. Back to my descent out of the clouds over Almaty. I do not think I have ever had as stunning a view greet me while landing as I had that morning. Having expected ‘dry and arid’, as I mentioned in my introductory blog, I genuinely thought, if only for a moment, that the aircraft had taken a U-turn over Europe and flown back to the UK. To the north, the landscape was a rich green as far as the eye could see but, as lovely as this view was, it was not this that took my breath away. It was when I turned to look south that I was stunned. 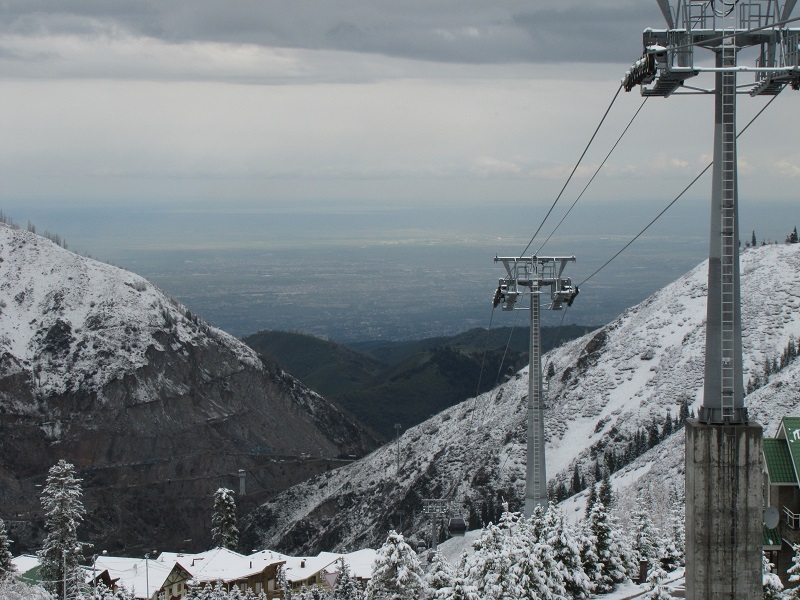 The northern section of the Tian Shan mountain system looms large over Almaty, covered in snow and rising to over 4000m. After the incredible flatness of the landscape leading up to them, one could be easily forgiven for seeing the Tian Shan and thinking that this is the edge of the world, that this mountain range, stretching as far as the eye can see, both east and west, is the wall that stops us from falling over the edge. And what about Almaty itself? It seemed to me that they had decided to build a city in the middle of a forest. Every road appeared to be lined with trees on either side, making it one of the greenest, leafiest, cities I have had the pleasure of visiting. An opinion that only further cemented itself upon landing and being transferred into the city itself. Unfortunately, though, I did not have much time in Almaty itself, as no sooner had I joined the tour group than we were whisked away to Shymbulak, our first port of call. 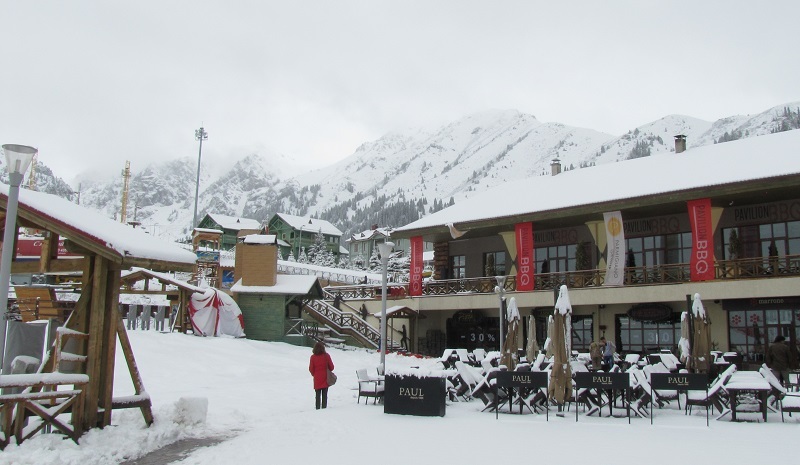 The thoroughly modern resort of Shymbulak is around 16 miles south of Almaty and was recently completely renovated in preparation for the 2011 Asian Winter Games. 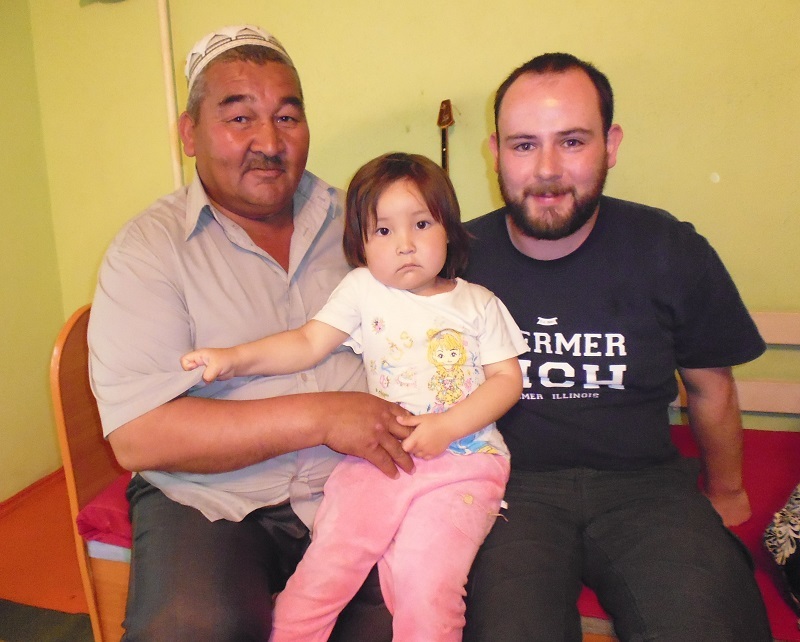 Shymbulak is perhaps the most ‘westernised’ of all the places that we visited in Kazakhstan. While I would love to tell you how good the skiing is there, we were limited to a short photo opportunity. Given the amount of snow on the ground though, particularly given this was the end of April, I can only imagine the skiing conditions are pretty good throughout the winter. We were lucky to have the resort to ourselves that morning, so we were afforded a peaceful and serene view of the Medeo Valley with the whole of Almaty spread out below us. In the near distance we could even see our next destination, the Medeo Skating Rink. The Medeo Skating Rink is the highest rink in the world, sitting 1,691 metres above sea level, and is also absolutely enormous, with a surface area of 10,500 square metres. Unfortunately there is no ice coverage in April as, due to the weather, it would be too costly to keep it at the correct temperature as it is completely open air, so our view of it was less than spectacular. In fact, it more closely resembled a car park with spectator seating; though, given the quality of some of the driving I witnessed in Kazakhstan, watching people attempt to park could be quite an entertaining spectator sport! 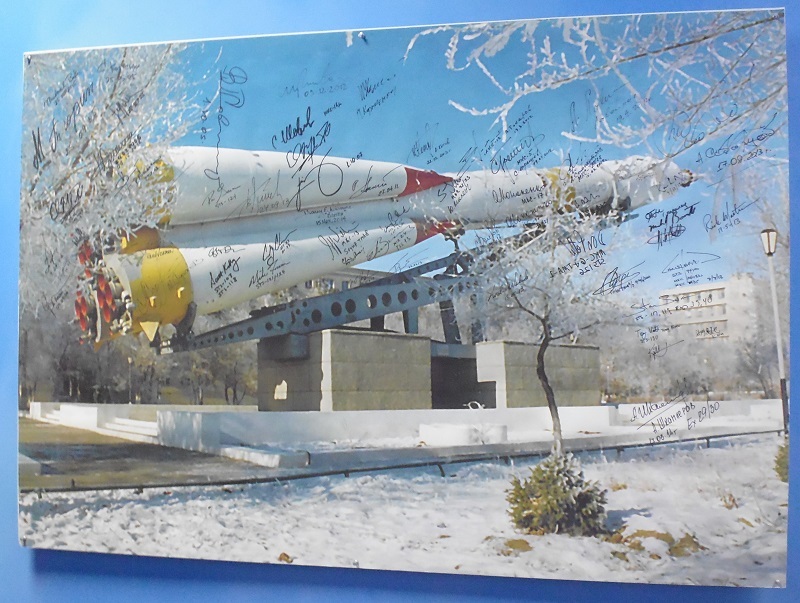 We were then rushed down to the National Museum of Kazakhstan for a disappointingly brief visit. I won’t go into detail on everything we were told, this isn’t a lecture, but I will say that the museum itself seemed to be very good. It is relatively modern, open, spacious and well laid out, with a lot of items on display. The only negative really is the lack of world languages on any of the signage, so if you want to get the most out of your trip there I would highly recommend a guide to talk you through all of the exhibits. Following our short time here we were back on our coach and heading to the airport for an internal flight to Kyzylorda. Upon arrival the airport is every bit the regional airport one would expect, lacking even a luggage conveyor; all the bags are left in a pile in the arrivals lounge, leading to a bit of a scrum as people try to get their bags as quickly as possible. The slightly basic airport does not represent Kyzylorda as a whole though, as the town itself is very nice. There has obviously been a lot of investment here since Kazakhstan became independent and, alongside the many green spaces and colourful flower displays, the city has a very modern feel. 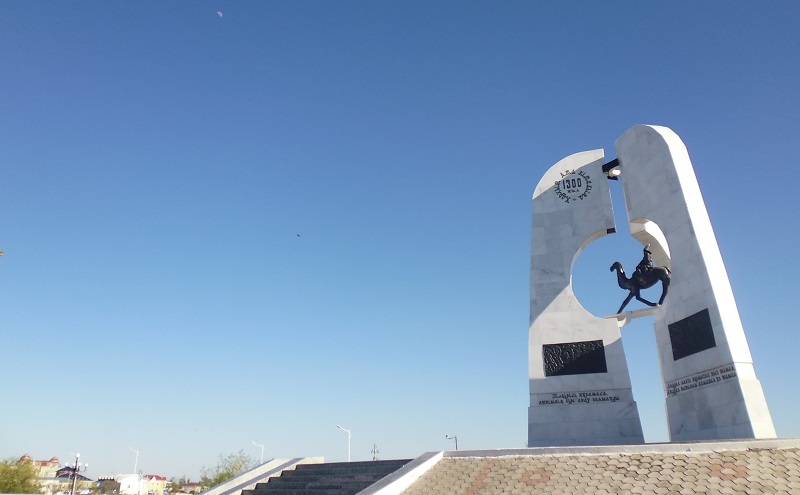 A monument in Kyzylorda – shamefully I forget the name! After a quick refresh at our hotel, we were offered a quick drive around Kyzylorda, including a visit to the local train station which, in true Soviet style, is an incredible building, with a lovely large open square in front. This station offers journeys to both Kazakhstan’s capital, Astana, and its largest city, Almaty, both of which are easily accessible thanks to a direct train from Moscow; though I would recommend making the journey part of a tour, covering the distance in stages, as Moscow to Almaty alone can take over three days! Our last port of call for the day was dinner, an official function that was being held for international businesses and tourism agencies. 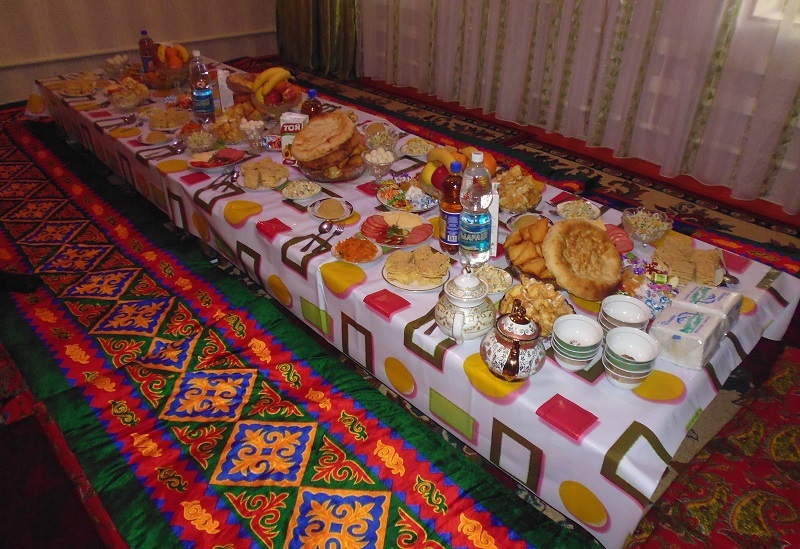 This was my first chance to try local Kazakh cuisine, though given the ‘silver service’ offered, it was not really offered to us in a traditional way! Of everything that was offered I had most been looking forward to trying the horse meat. I was also quite pleased to try baursak, a kind of fried bread. Our entertainment for the evening was a mixture of local folk singers, and folk music. Unfortunately my manners got the best of me in this instance, meaning I took no photos or videos, so I have nothing to show you, but rest assured, it was very good. And so ended a 36 hour day for me; from the UK, through a frustrating inability to sleep sat upright on a plane, to a long day travelling half way across Kazakhstan. Sleep came very quickly, though I was not to get very much as it was after 11pm when we returned to the hotel, and we were expected to be up for breakfast by just after 6am the following morning for another busy day! FULL DISCLOSURE: I originally posted this on www.realrussia.co.uk/blog under the title ‘Real Russia’s 2015 Visit to Kazakhstan’. Words and images are all my own. Well the answer is simple, I was lucky enough to be invited, alongside travel professionals from around the world, to visit some of Kazakhstan’s most incredible sights. 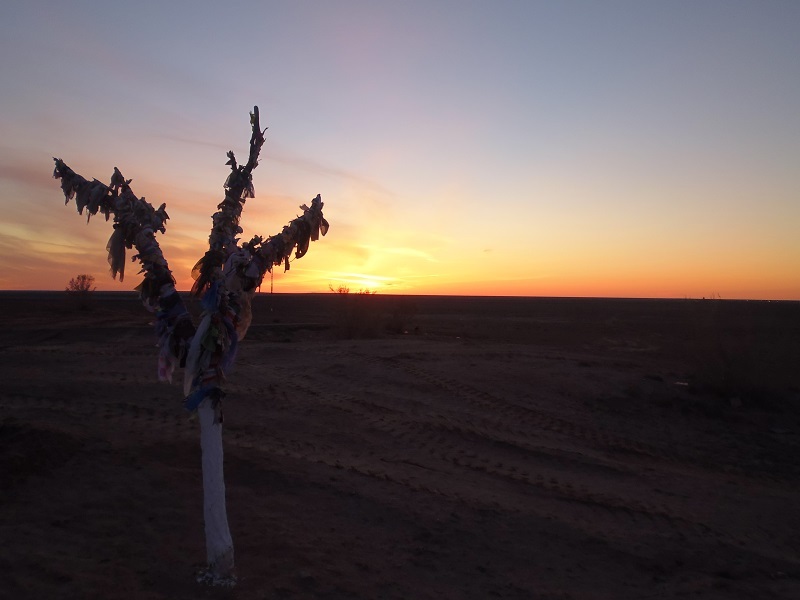 Over the course of eight incredible, enlightening, days, we travelled from east to west and back again, through the breath-taking south of Kazakhstan. The tour took in Almaty, Aktau, Kyzylorda, Shymkent and Turkestan, among many other fascinating locations; historical, spiritual and cultural. 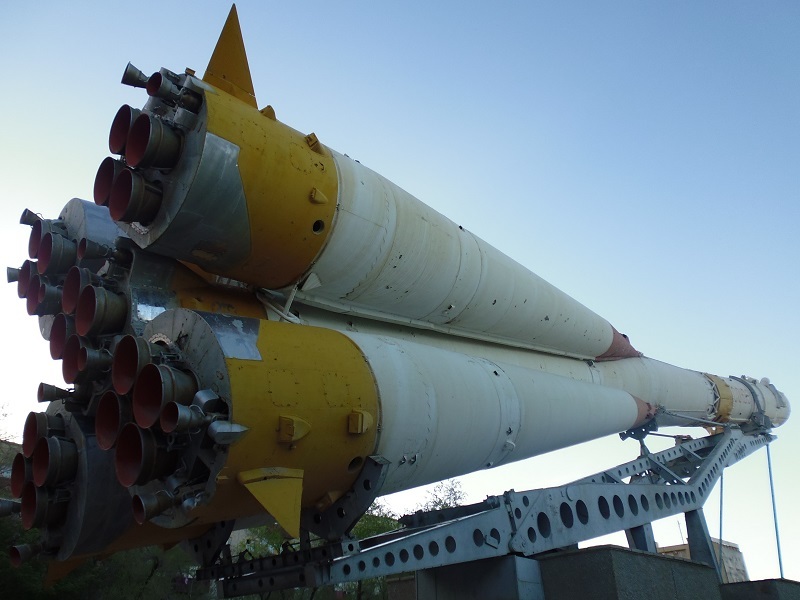 As a bit of a geek, I had expected my highlight to be a trip to Baikonur Cosmodrome, the launch site of the first manned space flight by Yuri Gagarin, and of many of Russia’s space adventures since but, spoiler alert, I found somewhere even better! Valiantly, I attempted to write a daily blog while I was there, so you could share in my experience. As you may have guessed, I failed. The tour was so full of incredible moments I just did not have time to even think about typing my experiences up! And I have been so busy since it has taken a few weeks to get my thoughts into a coherent order! 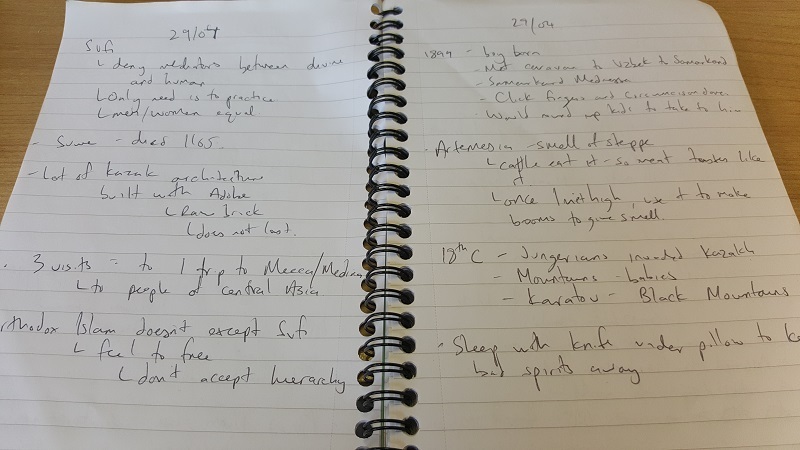 I did manage to take notes, so instead of a daily blog, I shall be sharing my experiences and, more importantly, my photos, with you over the next few weeks … if I am able to read my notes anyway; my handwriting isn’t great at the best of times, but while travelling along some of the bumpy roads of Kazakhstan it hit a new low! I attempt to share with you what I saw each day, where I went and how it felt. Warts and all. My, nearly, illegible notes – SPOILER ALERT! Many of you have already started to travel through Kazakhstan, Central Asia in general, and along the Silk Route. I am sure there are many more of you considering it, so hopefully this blog series may give you an insight into what to expect. For those of you who have never considered, and possibly never even contemplated the idea of considering, visiting Kazakhstan, maybe, just maybe, I can inspire you to add this incredible country to your bucket list. So, what expectations did I pack before leaving for, literally, the most unique trip I had ever taken? To be honest, I did not really know enough about the country to form expectations! Like many of you, I had never really expected to ever visit Kazakhstan, and it certainly wasn’t in my top 15 ‘countries to visit’. Shamefully, my primary exposure to the country was the Sacha Baron Cohen movie, Borat. It may be better to ask, ‘what did I know?’ I knew it was a country that only found independence following the fall of the Soviet Union. I knew that it was an enormous country, bordered by Russia to the north, China to the east, the ‘stans’ to the south and the Caspian Sea to the west. And I knew that, historically, the Kazakhs were a nomadic people. Based on this limited knowledge, if I really had to offer an expectation, it would be this – I thought that I would find quite a dry and arid country, with little of the greenery I am accustomed to at home in the UK. What you will come to see, through my blogs and photos, is that my expectation was entirely wrong. Yes, there are arid areas of the country, but many parts of the country are incredibly green and full of life. Colourful too. I came across wild tulips growing in conditions you would not expect, as well as fields of poppies growing as far as the eye can see across the steppe. 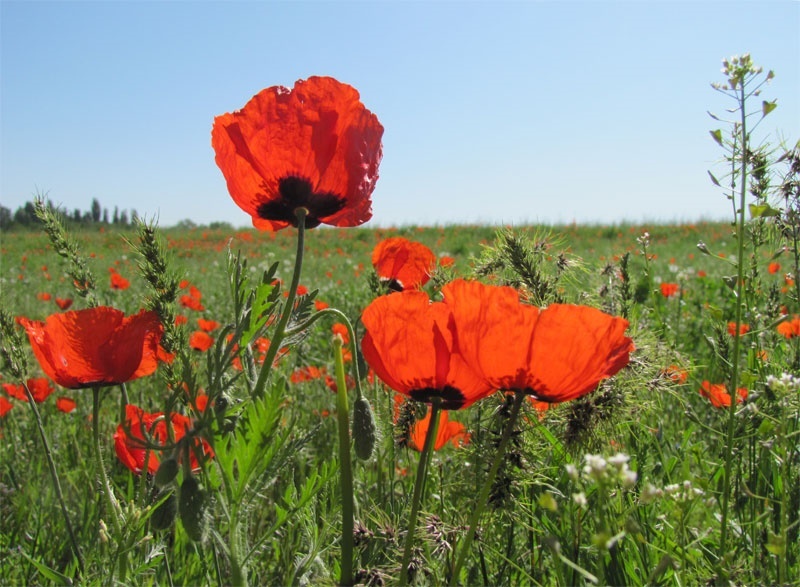 Wild poppies growing a short drive outside of Almaty. What had I expected to gain from this trip? A deeper, and more thorough, understanding of Kazakhstan and what it has to offer to travellers, as well as the opportunity to share my experiences with you. I also hoped to expand my horizons in regards to culture, history and religion by visiting a country and a culture that has grown and developed in an entirely different way to anything I have experienced before. Did I gain these things? I shall let you decide over the weeks to come. FULL DISCLOSURE: I originally posted this on www.realrussia.co.uk/blog under the title ‘Real Russia’s 2015 Visit to Kazakhstan’. 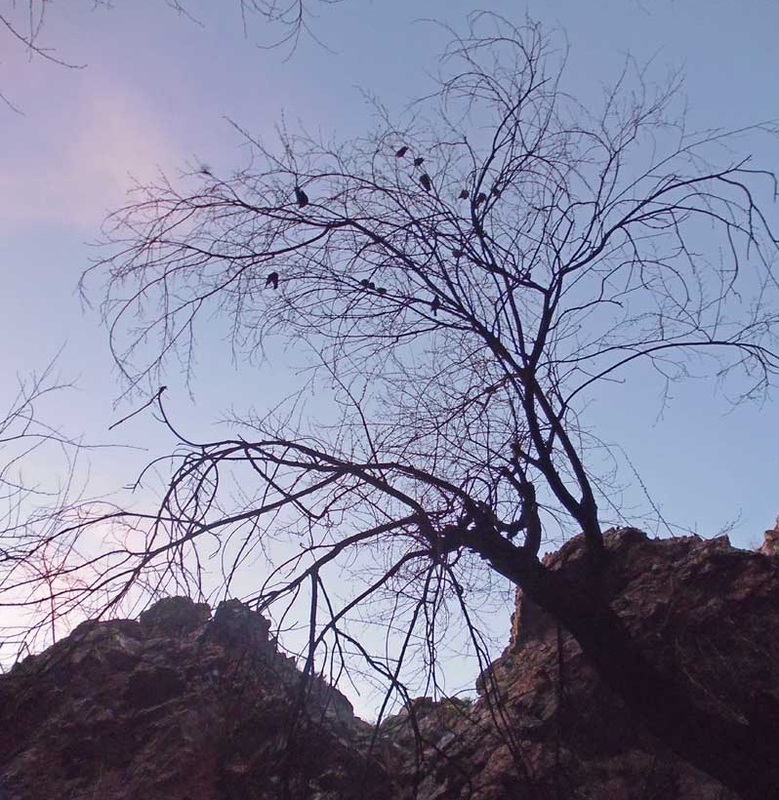 Words and images are all my own, video belongs to ‘Roots and Routes’. [UPDATE – 16/05/2014] – You can now find most of these on my new Spotify playlist. They are not all there, some are not available on Spotify, and some are only available in really bad covers which I have ignored. Thos that are there are not necessarily the originals. Videogame music availability on Spotify seems patchy at best! I shall be adding to this when I write part two of this blog post. Eventually. [ORIGINAL BLOG POST – APRIL 2014] – This will be a blog short on words, high on listening. The inspiration for this comes from the fact that a large proportion of the mucic I seem to listen to these days is that from videogames. In fact, right now I am listening to a Spotify playlist put together by the Facebook page ‘Get Video Games into the Classic FM Hall of Fame‘. The playlist can be found here, for those that are interested. They are on Twitter too, here. What made me choose today to write this, though, is that Classic FM are counting down their Hall of Fame again. So it seemed kind of appropriate. Over the last few years a number of videogame tracks have made it in there, a couple of which are included here; hopefully this trend will continue as there are some very worthy pieces of music. What I include here may not necessarily fit with what Classic FM are looking for and, certainly, my criteria are not quite the same as theirs. I am basing my judgements on: A) is it a cool piece of music, i.e. does it just sound good, and B) does it fit the game from which it comes, does it enhance what you feel about that game or, even, a particular scene within the game. This list is not exhaustive, it couldn’t be, but should hopefully give a good overview of soem of the best music gaming has to offer. It also includes no licensed tracks. Only tracks that were written specifically for their respective games.I am also attempting to stick to one track per game/franchise. Otherwise it would probably end up being nothing but Final Fantasy 7. I would be that bias, I openly admit it. Close your eyes, turn the volume up, and just soak it in. Plays a part in the story of the best horror game on Xbox 360. I urge you toheck out the whole soundtrack. This is Halo in one track. Mixes old world and future world perfectly; much like the cyber-punk design aesthetic of Deus Ex: Human Revolution itself. Captures the feeling of Rayman Origins underwater sections perfectly. Also check out ‘Land of the Livid Dead’. The level to which may inspire me to write a ‘Best Levels in Videogames’. This is as much ambience as it is music, but it most certainly has the palpable sense of dread required of Resident Evil 2. If this doesn’t send shiversdown your spine then you clearly do not have a spine. This is what happens when you let Hideo Kojima and Metal Gear Solid near a Bond theme. Perfectly named. The sort of intro song that stops you from pressing start. I didn’t go for the obvious one here. Brilliantly conjures up images of our hero battling through sandstorms to carry out his quest. Fits the jungle vibe of the DKC series perfectly. I challenge you not to have a little boogi to yourself. So, there is my list. It is longer than I had planned. And there is no Mario! I think a ‘part two’ is going to have to happen at some stage. What do you think? Is this a fair collection? What would you have chosen? What could I add in next time?